Looking for a last minute stocking stuffer? Keep on reading then, as I might have something for you! This project is fast and easy. A Moleskine decorated with my "signature" squares. 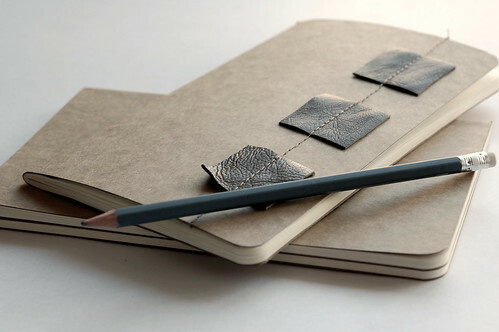 All you need is a Moleskine note book, a small strip of leather (or felt or any other non-fraying material), a ruler and pencil, repositionable tape, glue and a sewing machine. 1. Cut three (or any number of) squares from the leather. 2. With a ruler and pencil measure and mark on the front cover where the squares should come, distributing them evenly. 3. Use the repositionable tape to secure them into place. 4. Draw a line on the tape through the center of the squares - this will be the line you'll be sewing along. 7. Depending on how neat the cover looks on the inside (tension! ), you can "hide" the stitches with some masking tape and next glue the first page of the notebook to the cover, making use of a glue stick. 8. Finally, remove the repositionable tape from the front. And that's all there is to it! A perfect stocking stuffer!